Big news in the steep Douro Valley! Symington Family Estates, owners of internationally renowned Port brands Dow’s, Graham’s, and Warre’s is converting their three Vilariça valley vineyards entirely to organic farming. Quinta do Atayde, Quinta de Assares and Quinta da Canada, consisting in total of 146 hectares, or 361 acres, will gain their official “organic” certification in two years time. However, an organic Altano red wine has already been made from the 7 ha fully certified as organic at the Quinta de Assares vineyard in 2007 that is currently in barrel and will be released later this year. Having read this press release yesterday, what perplexed me was why these 146 hectares were chosen to be organic in their 900 ha. portfolio? What makes the Vilariça valley different? Like any successful business, the valley was chosen on the basis of location. As opposed to their vineyards banking the main Douro valley, the Vilariça valley enjoys colder winters and drier summers, in addition to schistous soils which allow for optimal draining. Couple this with an ideal pH range and balanced mineral nutrition in the soil that naturally produces low-yielding fruit, and you’ve got yourself a perfect spot for organic farming, or so Symington hopes. Another interesting factoid to note is that Touriga Nacional accounts for only 3% of the total vineyards planted in the Douro Valley. 3%! Considering that this is one of the main grapes in your basic port blend, that statistic is a little shocking. And of that 3%, Symington can boast that Vilariça valley is organically growing 31% of all Touriga Nacional in the Douro. Not a bad marketing angle! 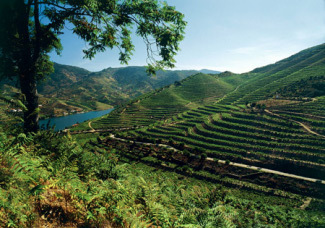 For the record, Touriga Francesa is the most widely planted grape in the Douro Valley. That said, will this effect my buying patterns? When considering the global climate change, will I buy more Symington wines as a result of their “green” stance? Honestly, it depends on the quality of the wine. When the Altano is released, and I discover that it is a good bottle, of course I’ll endorse it. But if it’s not a good bottle of wine at a decent price, just because it’s an organic wine, doesn’t mean I’m going to suggest that you run out and buy it.